[Unlimited Giveaway for72hours of] AOMEI Partition Assistant Pro. Discussion in 'Giveaways and Contests' started by sid_16, Nov 30, 2015. Ist I would like to thank Ms Catherine from AOMEITECH for sponsoring AOMEI Partition Assistant Pro (originally priced at US $39.00)but its free for our members and Guest. Offer valid for 72 hours. As Partition Magic alternative, AOMEI Partition Assistant Professional brings a wide variety of tools and user-friendly interface, which aims to make your PC disk partition management much easier and safer than ever. For example, it allows you to create, resize, move, merge, and split partitions without losing data to maximize disk space use. AOMEI PA Pro also releases new features like OS migration, Windows 10/8 To Go and much more. Keep abreast of the latest technologies like dynamic disk, GPT/UEFI, and SSD migration. Support Windows 10, Windows 8.1, Windows 8, Windows 7, Vista, and XP. Are you looking for a stable and full-featured partition management software which can handle all operations on partitions? Are you fixing the problems that system disk is out of space, the original partition is not proper, create more partitions or resize the original partition? How? 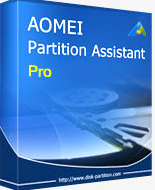 AOMEI Partition Assistant Pro is your best choice right now. The upgraded AOMEI Partition Assistant Pro is packed with more perfect features which are increasingly improved on features and quality. Along with the number of application installations and data volume increase day by day, this makes C: drive being crammed, the system performance is being affected directly. You may get annoyed about the imperfection of the computer because it gradually moves slowly and sometimes certain program refuse to execute when you need to use it urgently. Right now, AOMEI Partition Assistant Pro provides the tool, Extend Partition Wizard will help you to increase partition capacity as easy as a pie (just need a few mouse clicks). Nowadays Solid State Drive (SSD) is increasingly popular. Due to its small capacity, we frequently use it to take the Operating System. Since the OS installed on SSD, it can be started and run as fast as you imagine. AOMEI Partition Assistant Pro provides to migrate your existed OS to SSD easily without installing all existed applications. Save you a lot of time and energy. Moreover, the features allow you to migrate OS to traditional hard drive (HDD) and support GPT and MBR disk. Migrate OS on MBR or GPT disk to Solid State Drives (SSD). Migrate OS from MBR disk to GPT disk and vice versa. Convert system or data disk between MBR and GPT partition styles. Convert dynamic disk to basic disk and vice versa. Convert file system from NTFS to FAT32 and vice versa. Convert partition from primary to logical and vice versa. Copy partition to another hard drive for moving system or backing up data. Copy disk to disk without reinstalling Windows and applications. Fast search helps you quickly recover deleted or lost partition. Full search will scan each sector of the selected disk for recovery. Make a Windows PE bootable CD/DVD or USB without installing Windows AIK. Troubleshoot computer problems and recover data when the native system fails to boot. Create Windows 8 To Go bootable USB drive without Windows 8 Enterprise. Build a portable and fully functional Windows 8 system on USB flash drive. If you are running Windows Server operating systems, please choose AOMEI Partition Assistant Server Edition. If you would like to maintain many computers within one company, please choose AOMEI Partition Assistant Unlimited Edition. If you need to provide paid technical services to your clients, please choose AOMEI Partition Assistant Technician Edition. All storage devices recognized by Windows, such as IDE, SATA, iSCSI, SCSI disk, IEEE1394 (FireWire), etc. The GIVEAWAY is live now.